It's a quesadilla. It's a burrito. It's a Quesarito. Yum! 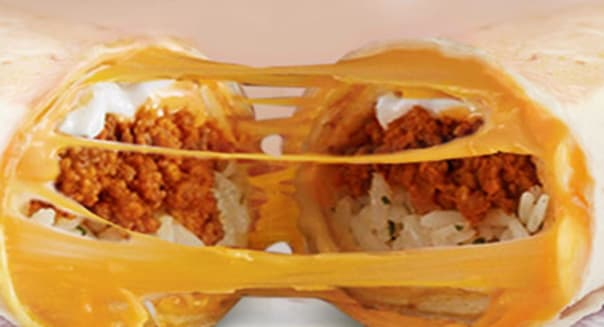 Brands' (YUM) Taco Bell rolled out the Quesarito nationwide on Monday. The burrito wrapped in a quesadilla is the latest bold move by the Mexican fast food chain that's been raising the flavor bar with everything from Doritos-dusted taco shells to waffle-backed breakfast sandwiches. The new treat is cheap, just like most Taco Bell creations. The suggested retail price is just $1.99 for ground beef. Shredded chicken is $2.79, and steak is $2.99. The decadent concoction -- where a quesadilla blankets seasoned rice, chipotle sauce and reduced-fat sour cream -- starts at 620 calories and 30 grams of fat. If early results are any indication, the Quesarito is going to be a big fat hit for Taco Bell. PYum! Brands -- the quick-service giant that's also behind Pizza Hut and KFC -- claims that the Quesarito was a hot seller in Taco Bell's test markets before the national rollout on Monday. The only product that fared better is the Doritos Locos Tacos, and that was a marriage made in fast food heaven. Doritos is owned by PepsiCo (PEP), the soda and salty snacks giant that once owned Taco Bell before spinning off its eateries as Yum! Brands. %VIRTUAL-article-sponsoredlinks%It made perfect sense that the two should come together to create taco shells flavored after popular Doritos corn chip varieties. Taco Bell has gone on to sell 825 million Doritos Locos Tacos since being introduced two years ago. The origin of the Quesarito is unusual. It's been a "secret menu" item at Chipotle Mexican Grill (CMG) for some time. It has the same name. It shares the same concept of a quesadilla doubling as a flour tortilla in a burrito. The Chipotle Quesarito costs more and has more ingredients. It's also larger. It's premature to say that Taco Bell is copying Chipotle because no one really knows where the decadent practice of a burrito-stuffed quesadilla originated. However, it won't be long that it becomes associated primarily with Taco Bell like the Gordita and Chalupa. Taco Bell doesn't have a problem taking chances. Doritos Locos Tacos was bold, and it has gone on to offer several versions. Plus, there have been other innovations in the brief timeline between Doritos Locos Tacos and the Quesarito. Just months after the debut of Doritos Locos Tacos in 2012, it rolled out a Cantina Bell line of premium offerings drummed up by chef Lorena Garcia. Taco Bell's biggest gamble may have taken place three months ago when it dove into the breakfast market. Most chains would've settled for breakfast burritos, but Taco Bell tweaked its CrunchWrap to feature scrambled eggs and a hash brown patty. It topped a taco-shaped waffle with scrambled eggs, cheese and either sausage or bacon. It's a safe bet that if the Quesarito is a hit, it will inspire a breakfast offshoot. Despite posting negative same-store sales during this year's first quarter, Taco Bell has treated Yum! Brands investors well with several strong periods before this likely temporary lull. Between the breakfast rollout in late March and now the Quesarito in early June, we should see a healthy spike in comps when Yum! Brands reports its second-quarter results this summer. Motley Fool contributor Rick Munarriz has no position in any stocks mentioned. The Motley Fool recommends Chipotle Mexican Grill and PepsiCo. The Motley Fool owns shares of Chipotle Mexican Grill and PepsiCo. Try any of our newsletter services free for 30 days.